A new annual study administered by the Office of Personnel Management showed a dip in employee satisfaction ratings government-wide, with several agencies results significantly worse in the 2012 Federal Employee Viewpoint survey than in 2011. Over 687,000 participants responded out of 1.6 million employees, more than twice as many as any previous survey, making this the most inclusive survey to date. The employee engagement at the Nuclear Regulatory Commission continued its downward trend however, down 3 more points from 2011. 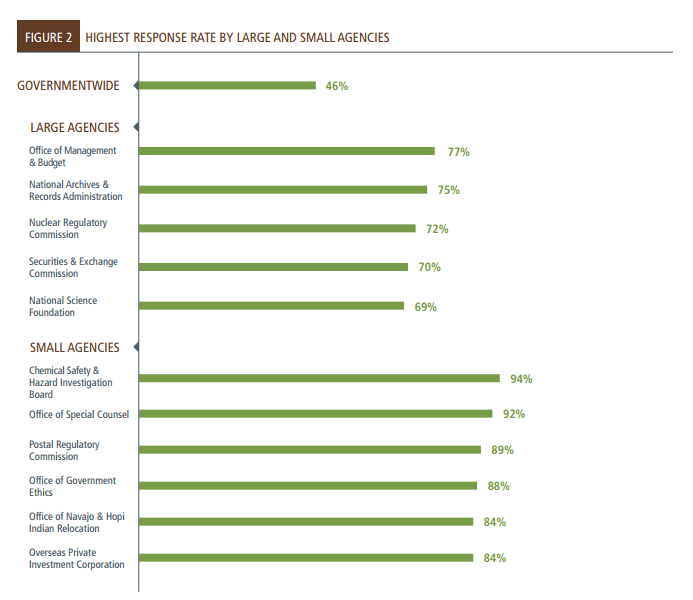 While many agency scores were relatively high, the overwhelming majority of agencies’ scores declined from 2011 to 2012, and approximately 40 percent are at or below 2008 levels. To illustrate this overall downward trend, although Nuclear Regulatory Commission retained their top spot in 2012, their score is down five percentage points from 2011, and is the lowest score recorded since before 2008. Agencies with the most significant declines include the National Archives and Records Administration, the Nuclear Regulatory Commission, and the Social Security Administration. The Nuclear Regulatory Commission was among the top-rated agencies in the 2011 survey, but experienced an across-the-board decline in employee satisfaction ratings in this year. NRC’s scores declined significantly in every category, Leadership & Knowledge Management, Results-Oriented Performance Culture, Talent Management, and Job Satisfaction. Identify survey questions (or sets of survey questions in a specific area) that notably differ from the agency or organization’s scores in past years. Are these trends occurring in certain sub units (including those with similar functions like regional offices) but not others? What practices have been adopted that might explain these improvements or declines? In what areas do the agency or key sub-components do the worst compared to other similar agencies? What other agencies are worth studying to try to find better practices to adopt? In what areas do the agency or key sub-components do the best compared to other similar agencies? Is this a strength worth celebrating? It is important to identify areas for improvement, develop and then execute a plan for improvement. Look at areas of strength, especially among sub-components, and opportunities to try to replicate and spread the successful practices, leading to better scores. Identify the causes behind the scores – numbers only describe WHAT an employee feels not WHY he or she feels that way.